Overlooking Glacier National Park and nestled among the birch and pine trees, these newly built log cabins are only 1/2 mile from the West Entrance of the Park and are the best base camp you'll find in the area. There is also a trout pond, an outdoor pavilion with BBQ area, horseshoe pits, and volleyball. 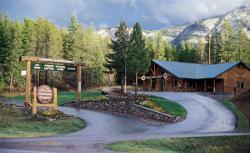 Easy access to horseback riding, hiking, rafting, Mountain biking, cross-country skiing and snowshoeing. Our one and two bedroom cabins have a master bedroom, living room, a completely furnished kitchen, full bath with shower/tub, television, a gas fireplace to warm you on those cool Montana evenings, and a beautiful covered deck with gas barbecue. The one bedroom cabins have two queen sized log beds and plenty of room for a couple more people on the log hide-a-bed in the living room. The one bedroom cabins have a maximum occupancy of 6 people. The two bedroom cabins have basically the same floor plan as the one bedroom plus a complete downstairs with sitting room, full bath and large bedroom with two queen-size beds. The two bedroom cabins have a maximum occupancy of 14 people. Glacier Raft Company extends an invitation to join them for an experience that will be the highlight of your vacation - an adventure on the river. Learn a bit of history and geology and view abundant plant and animal life as the professional Glacier Raft Company crew show you the beauty and excitement of one of America's most scenic areas. Many different trips are offered including full and half-day scenic whitewater floats and evening supper floats from West Glacier plus multi-day fishing and combination trips. View the various screens of this record for more details pertaining to the variety offered including wilderness experiences and hiking adventures. Glacier National Park, the Great Bear Wilderness, and the Flathead River are among your options. You also have the option of customizing your own wilderness experience. Fishing, hiking, horseback riding and rafting are some of the activities you can choose from to design that perfect outdoor adventure. Tell us what it is you want to do and where you would like to go, and we will handle all the particulars to make your customized vacation the perfect adventure. Fishing trips and photo trips are available by reservation only. Special dates can be arranged for groups. Wet suit rentals and raft rentals are also available. Glacier Raft Company provides wet weather gear for half and full day trips only, Coast Guard approved life jackets and transportation to and from the different rivers. .nestled among the pines and away from the highway. 25 minutes from Glacier Park International Airport and 5 minutes from Amtrak Depot in West Glacier/Belton.